Trainer Danny O'Brien is expecting big things in the future from well-bred, lightly raced four-year-old Xavi following his demolition job in Heat 9 of the Tour of Victoria Mile Series last night at Moonee Valley. The $3.50 chance led jumped to the front from his inside gate before careering away to win by three lengths. "He has better races in store for him than this one, but it's pleasing to see him produce a performance like this at second start back from operation," O'Brien said. The Pentire progeny had throat surgery and was gelded leading into this preparation and following the win in the 1500m event, he took his career record to three wins and three seconds from eight starts. Jockey Craig Newitt said it was a commanding performance from the full-brother of Group 3 winner & Group 1 placed, He's Remarkable. "Dan left it up to me from the inside gate whether we led or not, and although he did get a little keen early, he relaxed well down the side and he gave an excellent kick entering the straight and was strong through the line," Newitt said. "This horse has a good future." 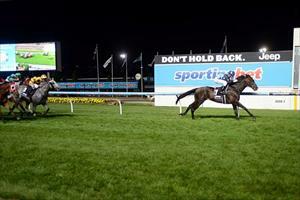 O'Brien also trained Xavi's half-sister Fashion Black, who won multiple races at Flemington in her racing career. "He is from a wonderful family and hopefully the owner's patience with him will pay off in the future with a nice race or two," O'Brien added. The next target for Xavi is likely to be the $100,000 Tour of Victoria Mile Series Final back at the Valley on Friday, March 1. Xavi's win was the first of a race-to-race double for the O'Brien-Newitt combination, with the well-fancied Thorn Star proving too strong with an easy win in the final event on the night program.